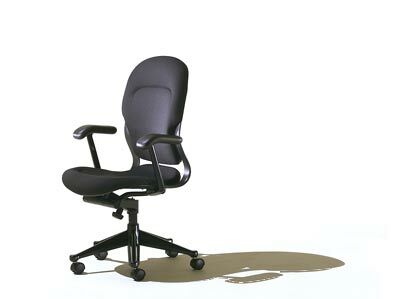 The Herman Miller Ergon chair that we looked at in the last post pretty much established the two-pad task chair form as the definitive task chair. This is the form that persists today and that you can find on everything from inexpensive work chairs from Ikea or at Staples, all the way up to premium contract task seating such as the Ergon chair still in production today. Despite its dominance, there have been notable exceptions to the two pad model, some which have established new forms that appear to be taking hold as strongly as the two-pad form, but I'm getting ahead of myself. 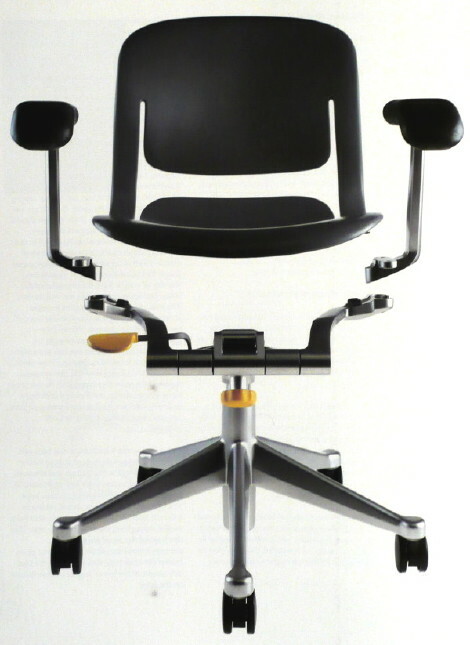 One of the chair designs that broke the two-pad mold was the Herman Miller Equa chair introduced in 1984, designed by Bill Stumpf (of the Ergon chair) and Don Chadwick who would famously reunite for Herman Miller later to design the Aeron Chair, another milestone in task seating. The Equa chair was unique in that it is based on a one piece fiberglass reinforced resin shell, much like an Eames shell chair which it owes some of its heritage to. But unlike the Eames shell the Equa's body is cut away in an "H" pattern to divide it into a seat and back and allow the shell to flex responsively between the two. In some ways it is a throwback to earlier one piece desk chairs that were essentially a wooden chair with castors replacing the legs. 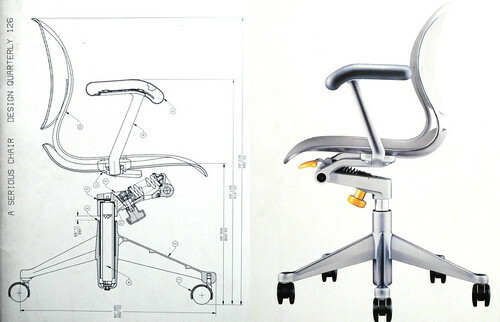 But its not - its inherent flex made the one piece dynamic and responsive in a way that a fixed chair could never be. The shell is typically upholstered, with an option to have the flexible seat/back connectors and shell back exposed. Early in its production the chair could be ordered with no upholstery at all which revealed the shell in all its thin and graceful elegance. Unfortunately this option was eventually eliminated sometime in the 1990s when the chair design was updated to introduce the latest task chair technology to the Equa - like the Ergon Herman Miller updates and improves the features through the life of the chair's production. - the 5 star base, now universal is more resistant to tipping than 4 leg bases. - hydraulic seat lift, again this is now the universal mode for height adjustment in task seating. - knee centric seat tilt. When a task chair has a tilting or reclining seat this is the superior way to introduce this motion. The hinge point is forward of the lift cylinder, typically very close to the front edge of the seat pad. When you recline, or tilt back, your knees naturally bend and your feet remain on the floor. Early tilting chairs hinged at the center of the seat pad at the top of the base post. As you could imagine tilting back would elevate the front edge of the seat putting you on your tip toes to stay in contact with the floor. This is uncomfortable and introduces tension into your muscles. A knee tilt geometry in a task chair is immediately apparent as the motion and position is much more comfortable. - Adjustable arm heights. Chair arms are no longer a static item. They often include height adjustment to support your elbows, and many also pivot or rotate to make an even more accommodating element of the arm rests. Without a doubt Herman Miller has the very best quality of chairs. I just bought an Aeron from --.com because I had heard how great the chairs are. I went to a warehouse sale and got to sit in one. They weren't cheap though which is why this site was so perfect for me. Great service and great prices. There are lots of great task chairs out there, but no doubt Herman Miller has always pushed the limits with new ideas and new chair forms. That's why their products are framing this review of task seating progress. Is it possible to get these chairs reupholstered?? I'm currently wondering the same thing. Did you ever find out if it is at all possible? You are asking in the wrong place my friend! Call Herman Miller.